Female sailors can soon sport several new hairstyles including locks, ponytails and options that fall below the collar in certain uniforms, according to new approved regulations. Lock, or loc, hairstyles and buns that span the width of the back of a female sailor's head will now be authorized for women in all uniforms. Ponytails will be OK in service, working or physical-training uniforms -- provided there's no operational safety concern. And hairstyles that hit beneath shirt, dress or jacket collars will be approved in dinner-dress uniforms. The changes were approved by Chief of Naval Operations Adm. John Richardson and Chief of Naval Personnel Vice Adm. Bob Burke, and announced by six members of a working group during a Navy Facebook Live event. Richardson credited the working group, which took feedback from the fleet, with coming up with and presenting the new grooming recommendations. "We just demonstrated that a recommendation can make things happen, so I want to hear from you," he said. If a female sailor's hair falls beneath the collar now, she�s limited to buns, braids or cornrows. Ponytails were only previously authorized in PT uniforms. 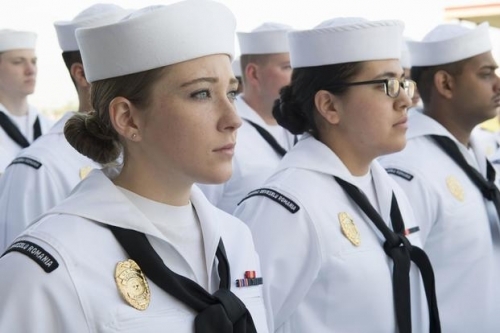 Last year, Richardson approved a move to allow female sailors wearing ball caps to wear their bun through the hat's opening rather than underneath it. The Marine Corps was the first service to approve locks for women in 2015. The Army also authorized dreadlocks for women earlier this year. Some black female service members have complained that they've been forced to wear wigs in uniform in order for their hairstyles to meet military standards. Hairstyles like locks give those women more options for styling their natural hair. Richardson said policies and regulations shouldn't just make the Navy more lethal toward its adversaries, but should also make the service more inclusive. Full details, including a timeline on the changes and implementation guideline, will be announced in an upcoming service-wide administrative message.